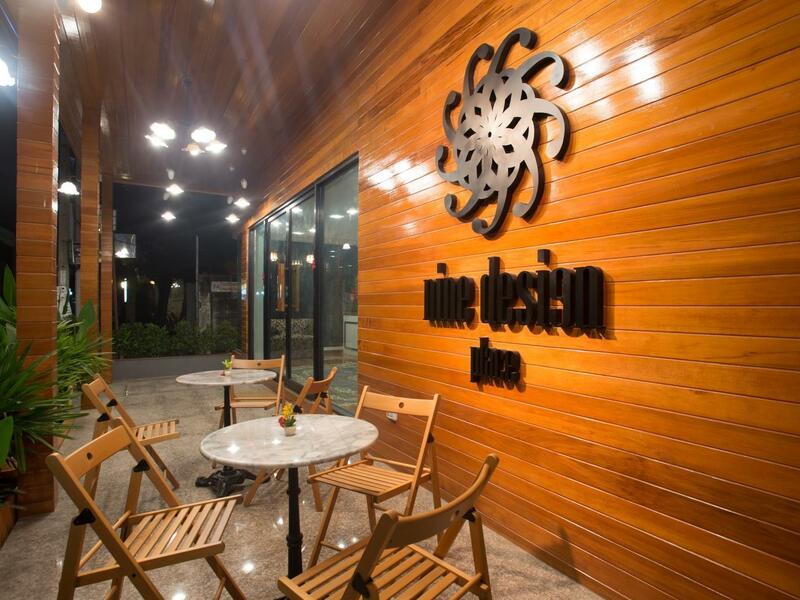 Σε πολύ καλή τοποθεσία της Μπανγκόκ, το Nine Design Place είναι μια πολύ καλή βάση απ'όπου μπορείτε να εξερευνήσετε την σφύζουσα πόλη. Το ξενοδοχείο δεν απέχει πολύ από το κέντρο της πόλης: μόλις 1 km, και συνήθως χρειάζεται περίπου 30 λεπτά για να φτάσετε στο αεροδρόμιο. Από τη βολική της τοποθεσία, η ιδιοκτησία προσφέρει εύκολη πρόσβαση σε κορυφαίους προορισμούς της πόλης. Στο Nine Design Place, η άψογη εξυπηρέτηση και οι ανώτερες εγκαταστάσεις συντελούν ώστε η διαμονή εκεί να σας μείνει αξέχαστη. Μια επιλογή από εξαιρετικές ανέσεις όπως τα δωρεάν WiFi σε όλα τα δωμάτια, 24ωρη φύλαξη, 24ωρη ρεσεψιόν, ασύρματη σύνδεση Wi-Fi σε δημόσιους χώρους, χώρος καπνιζόντων σας περιμένουν στο ξενοδοχείο. Όλα τα καταλύματα διαθέτουν τις απαραίτητες ανέσεις για να εξασφαλιστεί μια ασυναγώνιστη αίσθηση απόλαυσης. Εξάλλου, το ξενοδοχείο διοργανώνει πολλά ψυχαγωγικά δρώμενα έτσι ώστε να έχετε πολλά πράγματα να κάνετε κατά τη διαμονή σας. Όποιος κι αν είναι ο σκοπός της επίσκεψης σας, το Nine Design Place είναι μια εξαιρετική επιλογή για την διαμονή σας στη Μπανγκόκ. Good location, good staff, good bed, good breakfast. This hotel is small, but very clean and nice. Location is really good and the service they provide is like none other. Free drink, free snack, special afternoon deserts, gift, etc. Owner is super nice and amazingly she can speak Japanese! This hotel will be where we are going to stay in Bangkok from now on. Spent one night here and it was wonderful. The hotel is small and friendly. 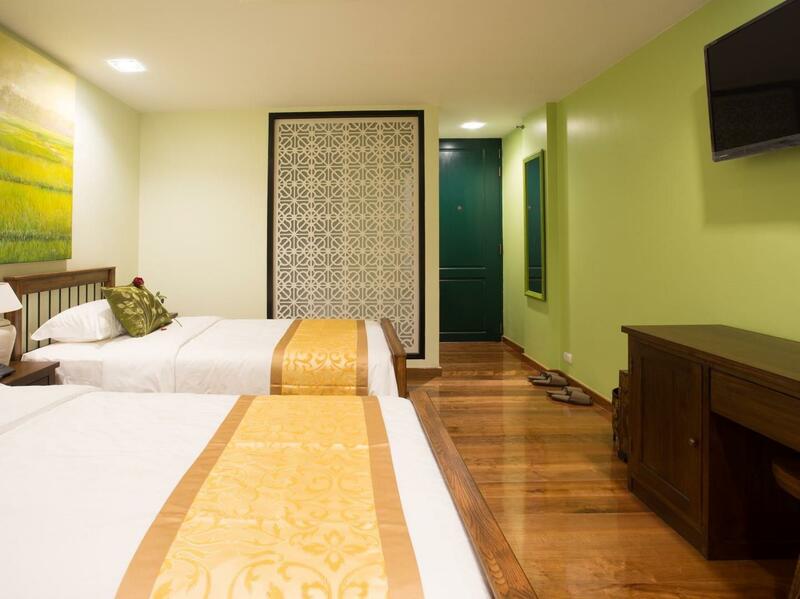 The rooms are not large, but clean, well maintained, and comfortable. I appreciated the fact that they had water and juice in the room for free. The staff was very helpful--a little bit difficult to communicate in English, but not a problem. No restaurants nearby, except for the mall's food court. All the reviews of all the guest who have stayed here are very true. I couldn't ask for more, they treat you as you own the home offering you great service, bring sweets to your room, unlimited water, cola and coffee drinks. Mel the owner is very accomodated. In return as next door having construction they offer us free breakfast every day except for the last day they gave us goodie bags for us to bring in the airport as we left very early. Would highly recommend this place. And we will come back to stay here when we return to Bangkok. Beautiful room and hotel. Aug 2018 there is a huge building being constructed next door, so it’s very loud during the day. Staff seems a bit undertrained. Often seemed confused about checking in procedures or giving directions. Lots of staff sitting in lobby on their phones. Customer service just okay. The hotel is absolutely worth its value. It's located inside an alley like most hotels in the city but the short distance to walk to BTS stations as well as other facilities (convenient stores, supermarket, shopping centre) makes it just perfect. The hotel is clean and beautifully decorated. The size is considerable and the bed is comfortable too! Front desk staff have good English skills and are most helpful! Loved the little departing treat of mangosteen! Will definitely be returning. The location is great and very close to National Stadium station. You can also walk to Siam Station in 15 mins , on the way there is McDonald, 7-11, massage store , MBK mall etc. The hotel looks new and clean , same as the room. We got free breakfast for one day and it was delicious. The only bad side was there is a construction going on next to hotel, it starts from 8am-7pm EVERYDAY and it creates huge noise. If you like to start you day early that's no problem, if not, you might need to be aware. The hotel staff is kind and helpful. They are always ask us to had the free drink refreshments and helping us to call taxi. Also by chance i meet the owner of this hotels. She is really nice and beautiful. When we check out that day and she gave us some souvenir and Thai dessert to taste. i really had surprised by stayed in this hostel. Hope to see you soon ! The staff was so nice. She offered us a free breakfast as a compensation of the noize from construction site next to its building. She even offered free beverage and tee, coffee even water saying we could enjoy them all while we're staying and even after we check out because it was our last day and we needed to rest at the hotel until late night. So although we checked out already, we had space (lobby) to take rest. the day we left, she gave us some phone accessaries and small candles for souvenir and that was so warm and kind. the location is also great because there are exchange office at competitive rate and mc donald, good massage shop (i went there) even Siam discovery, Siam paragon, MBK in 5~15min walk distance. Is the little touch like dessert upon arrival, special note by the owner, home cooked kind of breakfast that make the place unique, even the staff do not speak well English, but they deliver the Thai hospitality, area to improve are 1) please keep some light in the corridor at night, not complete darkness for security reason 2) Bathroom towels need to replace already, a bit tired and stained. 3)4 pillows instead of two, is too flat. 4)window cushion cover in my kids room need to change, a bit dirty for room 301. Overall is a great place to stay, is small and cosy, and thanks for the take away breakfast on our early check out day. Glad that it is an superb stay experience for me in Bangkok. The lady who managed the place in the day time K. Mei is such a delighting person. She managed to provide the greatest experience both pre-arrival and arrival. Not to mention the location is just in the heart of Bangkok. Recommend! A small boutique hotel, good location , clean and great service from the staff .The lady boss is very polite , cheerful and really make one feel at home staying at this hotel. I will stay here again on my next visit to Bangkok. Really well designed hotel, not far from MBK/Siam. Quiet (but some construction next door). Calming, and relaxing. Not a place for a party buzz. Ower very halpful, and does a great breakfast. Pros: Free coffe, juices, water, soft drinks all day. Breakfast until 10.30qm. Very clean. Good showers, Comfy bed. 20 minute walk to airport rail link. Cons: Not many: No cable TV. Alot of staff using shared areas. 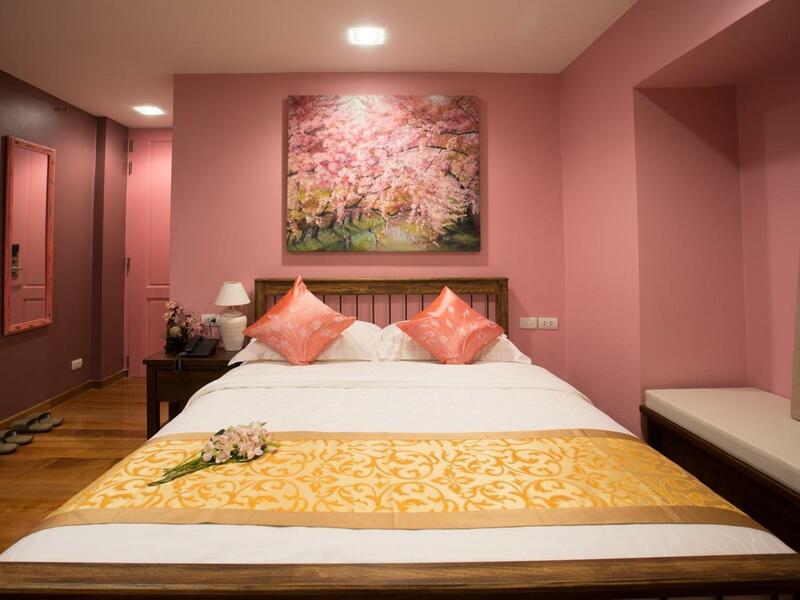 The location is good and easy to find, near BTS station and near the Siam shopping center, which is convenience for the one who first time to Bangkok; Clean place and warm as the host of hotel give me a warm welcome and free delicious breakfast! She is nice and give me some famous snack in thailand when I leave the hotel, nice experience in this hotel! We been to Bangkok for many times. We often stay at at Pratunam area nearby pratunam plaza. That kind of area with ... 1. Morning market 2. Mostly lady's shirts market 3. Plaza 4. Night market! But traffic problem, Far from BTS, noisy, lot of peoples.... This hotel about 3mins walk to BTS, 4 mins to MBK (shopping mall). A busy place at day time but guiet at night. We checked in around 10pm at night. The beautiful owner was there to serve us with her lovely smile and welcome drinks. Morning breakfast very nice! First morning we need to go out early before breakfast ready but they prepare some fruits, cake and juice to bring along. Everything we feel so warm and so friendly, service - excellent! Room very clean and new. Next trip, I will stay in this hotel again! The hotel is small boutique hotel which is located very near to National Stadium BTS . Also walking distance to TESCO and MBK. The service is excellent and anyone who wants to have a nice stay will not be disappointed. I am very please with the service and nice breakfast prepared by the Owner. Nice stay I truly recommend this place to anyone either for business or leisure. Nine Design Place is an excellent boutique hotel. It’s our second stay and we’re happy to be back. The manager Mei and her staff are so attentive to our needs especially directions and transport. They serve delicious breakfast and snacks. The rooms good-sized and very clean. This is a gorgeous, tiny, friendly hotel. The service was impeccable. The room was beautifully and simply appointed and made up. Very very clean and attractive. The lift was tiny, but that was novel! It worked well! The service provided by the clerks and bell hops at the desk was simply delightful and the very picture of Thai hospitality at its best. I truly enjoyed my time resting here. It’s is within very easy walking distance of Siam Square, and the BTS sky train station, National stadium. The breakfast and other caring touches supplied theoughout my short stay were all fabulous, delicious, and abundant. I couldn’t speak more highly of this place! Anyone looking for a pool and room service may be disappointed, but if you can live without those things, you really can’t beat this place! Σταθμός BTS National Stadium στα 0.28 χλμ.